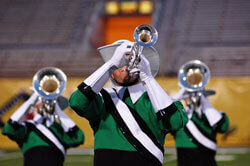 The Cavaliers have started storming through a hot and dry first week of July, winning contests in Michigan City, Ind. on Friday, July 6, and Saturday, July 7 in Canton, Ohio. Those two wins put the corps back ahead of Midwestern foe the Bluecoats, who had shocked and awed audiences like the grand finale of an Independence Day fireworks display on July 2 in Centerville, Ohio. There, the Bluecoats finished ahead of the Green Machine for the first time since the late 1980s. Drum corps fans at Saturday night's Canton show also saw the Blue Devils (83.600), who were surpassed by the surging Bluecoats on July 2, edge ahead of the hometown Ohio corps finishing in second place behind the Cavaliers (84.400). Jeff Fiedler, Cavaliers corps director, says the corps' recent success comes from several intense full days of rehearsal after a short break on the Fourth of July. "We recognize the competitive aspect of what we're doing, but that's not what motivates us to work hard," Fiedler said. "What we're doing with our program takes awhile to get under the guys' feet. We're now starting to see the results of a lot of hard work that we've done over the last three weeks." The Colts (75.000), Blue Stars (73.250) and Pioneer (65.250) also performed in Canton on July 7, an event which is run as part of the annual Pro Football Hall of Fame Festival, a summer-long series of events that lead up to the enshrinement of the Pro Football Hall of Fame class of 2007 in August. All six corps who performed in Canton tonight will make their way to Allentown, Pa. for the Sunday edition of the DCI Eastern Classic on July 8, one short but important stop on the road to Rose Bowl Stadium for this year's World Championships. "There's a lot more to come and a lot more to do for us. It's only July 7 today, and we've got more than a month to go," said Fiedler "There's a lot more to do not only for us, but also for everybody out there."